For only the second time, the Theatre Department will be staging a student-written production. Gillian Street’s Masque of the Red Death, a play inspired by the eponymous Edgar Allan Poe short story, will begin its run next week. Like the Poe tale, the play is about a macabre masquerade held in mad Prince Prospero’s castle, an aristocratic stronghold quarantined from the plague-infested outside world. While Street stays true to Poe’s hellish, claustrophobic vision, she explores not only the stealthy advance of pestilence but also the interactions of the courtiers, each of whom has a devilish buffoon as a mirror image. Street first began working on the play two years ago as an assignment for Kit Brennan’s playwriting course. The class was told to adapt a short story into a 20-minute play; Street submitted an hour-long, two-act production that impressed Brennan enough to circulate it to other professors. It piqued the interest of Robert Astle, who guided Street through a year-and-a-half rewrite process. These rewrites didn’t end until mid-November, a month into rehearsal. This, explained Astle, is quite atypical for the department, as it usually puts on established plays. For faculty member and stage manager Anne Clark, this process helps fulfill the department’s main mandate for shows: to give students great experience and prepare them to earn a living on the stage. This particular play also gives them a chance to do choral speaking, to work as an ensemble and, because cast never exit into the wings, to learn how to constantly be in character, even when not part of the action. “It’s a great learning process,” said the director. He’d love to see more student-written plays staged. For now, he’s focused on Street’s play, which opens next week. What would Poe think of her adaptation? “It’s certainly something that he never would have expected,” Street said. Masque of the Red Death, by Edgar Allan Poe, in a stage adaptation by Gillian Street, directed by Robert Astle, in the D.B. 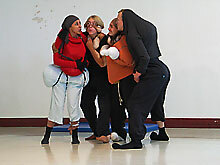 Clarke Theatre Dec. 11, 12, 13, 8 p.m., with matinées on Dec. 13 and 14 at 2 p.m. Call the Box Office at 848-4742 for tickets: $5 general admission.